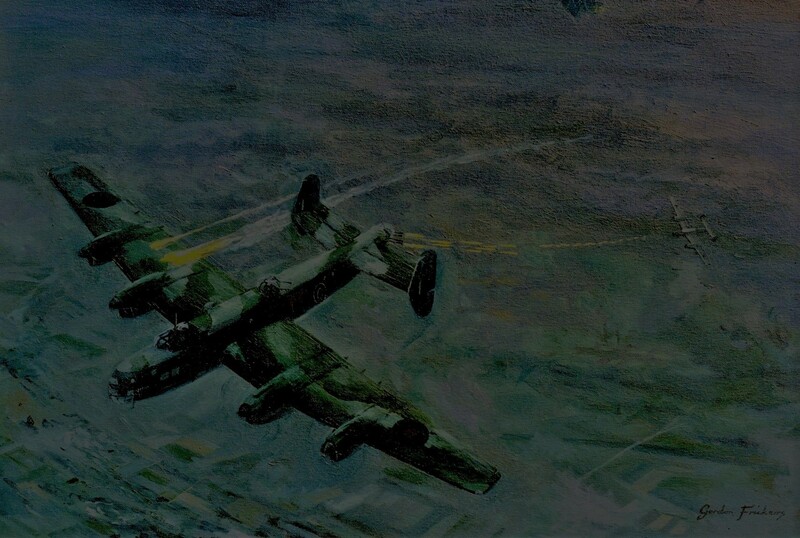 A Handley Page Halifax Heavy Bomber on its first operation, painted for an eye witness. An aviation painting 50 x 66 cm (20″ x 30″), oils on canvas, original commissioned by the late Mr.John Loban, formerly Flight Sergeant, navigator of this aircraft. John Loban blamed the R.A.F. for this loss and deaths of his friends. This Halifax heavy bomber aircraft was lost on it’s first mission, shot down by a night fighter that had been radar directed to the interception point. This particular aviation painting was painted for Mr. (formally flight sergeant) John Loban who when I met him had retired to Carlyon Bay, Cornwall. John was the sole survivor from this Halifax. This painting was created with the help of John Loban who among other things presented the me, the artist with the German radar and pilots reports, so detailed they even included how many rounds the Me 110 G4 fired, copies of which I still have on file. I researched further and built scale models of both aircraft as aides to perspective. Regrettably the models were abandoned when I had to sell the family home and my studio following an unwanted divorce. John Loban commissioned this painting of his aircraft but did not wish this picture to be exhibited during his life time, a wish I, Gordon Frickers have respected. John (navigator) and his crew trained in Canada for 2 years before this tragic flight. We even have the names of all the people involved and how many rounds the Me 110 night fighter expended. John Loban blamed Royal Air Force orders to take no evasive action if attacked, to stay in the bomber stream, for this loss. Their orders were‘if attacked while in the main bomber stream do not take evasive action‘. The risk was that by taking such action bombers would collide in mid air. To late for John Loban and his crew those orders were changed later in the war. Obtt. P. Barte-uffz flying a Messerschmidt Me 110 G4 was radar directed to his victim. John said their rear gunner saw and fired at the Me 110 but not before the night fighter had hit and set the Halifax on fire. The rear gunner did not live to learn he actually hit the Me 110; he did see it sheer off. The doomed Halifax started its final dive, only John Loban got out alive. He said that upon landing he buried his parachute then fell asleep in a ditch. This was quite a common reaction to the shock of being shot down. Later he was helped by French people but unfortunately the Germans were looking for him and the courageous French had little option but to give him up. During World War 2 the Messerschmidt Me 110, designed as a long range fighter was found incapable of effectively combating the British Hurricane and Spitfire fighters so was withdrawn after heavy losses during the battle of Britain. In a new role as a radar directed night fighter the Me 110 excelled. There is an example of an Me 110 at the excellent Royal Air Force Museum situated on the historic site of Hendon’s London Aerodrome in Colindale, North London, entrance free and that makes for a memorable day out. Relentless bombing by Royal Air Force (RAF) Bomber Command mostly at night and by day, the USAF, did much to cripple the NAZI German war effort. Bomber Command’s aircraft at the beginning of World War 2 were inadequate, some types hopelessly so due to dithering and at general lack of political will from people who mistakenly thought the Germans could be appeased. Only the twin engined Wellington could be described as modern. British engineers had forseen the problem even though the politicians had not. Once the funds were released, British bombers rapidly improved, the Handley Page Halifax being one of the most successful British bomber aircraft. The Halifax heavy bomber proved itself to be Britain’s No 2 heavy bomber, eclipsed only by the now ledgendary Avro Lancaster. RAF Bomber Command suffered 60 % casualties. Only 10 % of RAF Bomber Command crews who flew at the start of the war, lived to see it’s end. That was the price for diverting substantial NAZI resources away from front lines for defence while the RAF seriously damaged and disrupted the NAZI war effort. The bomber crews who perished undoubtedly helped save many lives and shorten World War Two. John Loban commissioned this painting of his aircraft but did not wish this picture to be exhibited during his life time. The eye witness account from Mr. Loban. “To see The dawn Breaking”, W.R. Chorley (76 Squadron Operations). Models of the Halifax B111 and Messerschmidt Me 110 G4. Mr. A. Frickers (Captain, retired) British army trained firearms & explosives expert and my Father.